I've been seeing kale pizza all over the internet, and figured while we're being vegan for a month or so, now is a good time to try it. I used Bob's Red Mill pizza crust mix, since I happened to have it in the pantry. I never use pizza crust mixes, but since we've moved I haven't fully restocked my flours. I was skeptical, since I don't normally love Bob's mixes (bean flour, yuck!) but this was actually pretty decent. I used chia seeds instead of eggs, which worked out well - 2 T chia in 1/3 c water. The kale steams a little on the pizza and then crisps, and if you use a ton of garlic like I did, this is so delicious. Garlic + crispy kale + tomatoes = really good pizza. Make sure you precook your crust enough because the pizza can't cook for that long or else you'll burn the kale. Also be sure to rip the kale into small pieces, smaller than you think you need to, or else you will end up eating all the kale off in the first bite. Heat your oven to 375 degrees. Prebake your pizza crust until just starting to brown. Toss the kale pieces with 1 T olive oil and set aside. Mix together the crushed garlic and the rest of the olive oil. When the crust is ready, spread the garlic and oil mixture evenly over the top. Place the tomatoes around on top, then cover with the kale. Heap as much as you can onto the pizza, the kale will shrink while it cooks. Sprinkle with salt and pepper and chili flakes. Bake 25-30 minutes, until the kale is cooked and the crust is browned. That looks amazing! 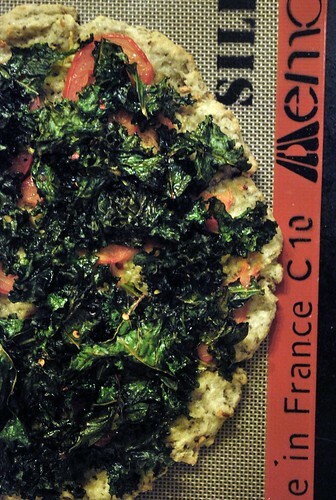 I would have never thought to make a kale pizza. Thanks for the great inspiration! You rock! I have a package of this pizza crust in my pantry and just hadn't tried it yet! There's a pizza place around the corner from us that serves gluten-free crusts: my partner doesn't mind it but I'd rather eat shoe leather, so I've been a little avoidant of this mix. Thanks so much - can't wait to try it this week. Sounds delicious! You don't miss the cheese? I'm currently trying to be dairy-free for a while, and that's my hardest part. But I suppose if you have other bright flavors, who needs cheese? I have made your gluten free pizza crust and it is awesome! 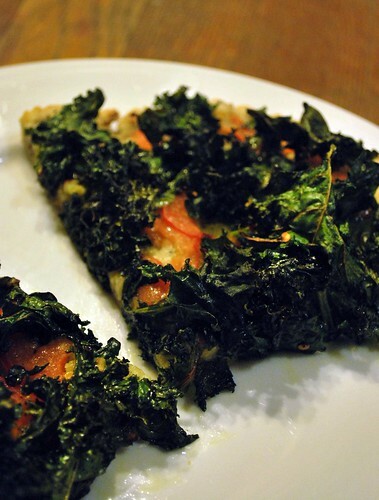 Now will try the kale pizza this weekend, looks amazing! We love kale and it is so good for us. Thanks! I made this pizza tonight (just finished eating it) and it tasted wonderful! My only modification was to use 6 cloves of garlic instead of 3-6 T of garlic. yum! looks so good! hope you are enjoying CT! Fixed this super easy recipe, very great taste! My husband even liked it which kinda suprised me! A great addition is sliced black olives!